Give the gift of a BCLA Notebook! The holidays are right around the corner, and this year, finding an ideal gift couldn’t be easier. BCLA notebooks make the perfect present for everyone on your list! The Moleskin-style notebooks — which are light grey in colour and complete with a ribbon for bookmarking and an elastic band for safekeeping — are a sleek and stylish option for anyone wishing to put pen to paper. Whether you require a reliable medium to jot down to-do lists, are keen on keeping a diary, or simply need to take notes, BCLA notebooks contain copious pages of lined paper for your writing needs. The notebooks are lovely to hold, easy to open, and appropriate for adults and children alike. Celebrating 25 years of the BC Summer Reading Club, the books are interspersed with prints of colourful art works by various BC artists for the provincial reading program. 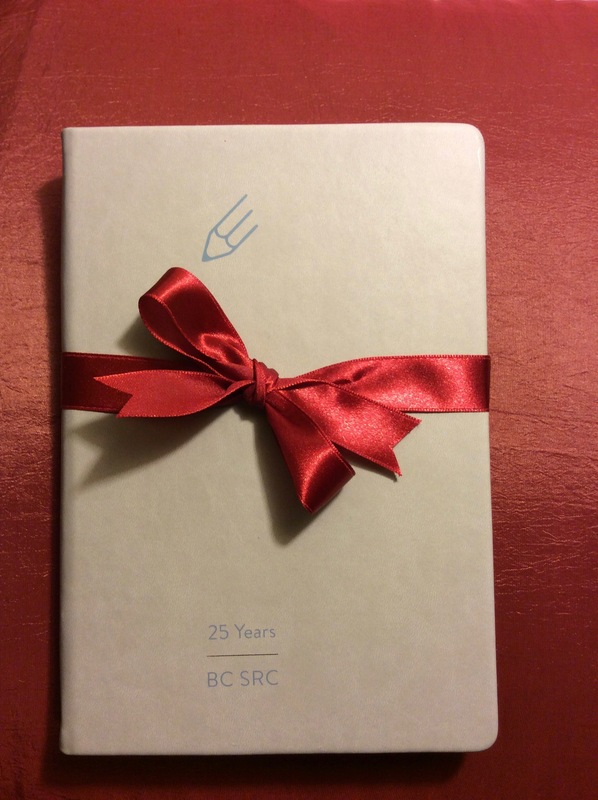 The BCLA notebook makes a beautiful and practical present for friends and relatives, Library Board Members, Library Staff, and as a show of library appreciation for Mayors, Councillors, Ministers, and other local government members. And of course, you’ll want one for yourself. (Happily, when you order a box, you’ll receive 16 notebooks for the price of 15!) Support BCLA and take care of your gift list all at the same time — now that’s good planning! Order online or by calling the BCLA office at 604-683-5354 (between 9 a.m. – 3 p.m., Mon-Thurs). Cost is $20 each, plus PST, plus $5 packing and shipping. Be sure to order yours today!